In what may be the most shocking poll results to date, the recent RSS survey has revealed that almost half of you that visit this blog do not subscribe to any RSS feeds! Zip. Zero. Nada. Now as a blog with an RSS feed, this is interesting and concerning news. I assume this news means that the nearly 45% of you that don't subscribe to RSS feeds are manually visiting this site (ahem) everyday to get your updates. Seems like a lot of extra work, but to each their own. 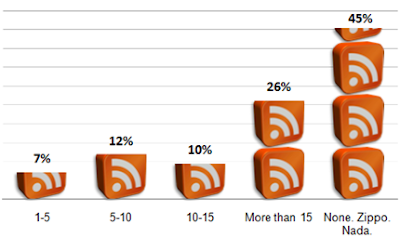 On the flip side, more than half of survey respondents do subscribe to at least one RSS feed. Still, I was surprised that only 36% of you subscribe to 10 or more feeds. I was under the impression that the tech geek crowd was habitually addicted to adding RSS feeds to their readers, but it appears you are much more discerning. To put it another way, 64% of you subscribe to fewer than 10 RSS feeds. Which ones make your elite Top 10? Personally, I fall in to the "10 - 15" feeds category, though I cheat a little by using Yahoo! Pipes to consolidate many of my related feeds in to a single stream. These survey results open-up a number of potential follow-up questions, but most interesting to me is why so many of you have shunned the popular RSS subscribing behavior. Is it information overload? Don't like the available RSS readers? Sound-off in the comments and help those of us relatively dependent on RSS understand your subscription-less world. For everyone else (and the non-subscribers, too), be sure to vote in the new poll that is the .NET equivalent of boxers or briefs: C# or VB? Lol, Exactly Dirk – I was just about to write the "same" thing! Btw, personally I have 150 blogs (divided into groups of technology and rank etc.) in the IE7 RSS feed reader - the reader I personally like the best. I just need a tool to discard the ones that has not been updated etc. Excellent point Dirk! That could definitely skew the results. For the RSS readers, though, I have started to announce new polls when an old poll finishes, so even RSS readers should be aware new polls are running. And I know a lot of people do subscribe to this blog (via Feedburner stats), so I have some other perspectives on the issue. I still think it's interesting to see how many feeds people admit to subscribing to, and that was my main goal. I receive, aproximately, 70 fedds. Araund 50 in english and the rest spanish, italian, portugues. half I receive emails from feedburner and a couple of other services, and the rest, I use a rss reader software. But their feedburner total for feed readers only reads 718k. Being Techcrunch is one of the definitive "tech geek crowd" sites I have to assume most people still don't use RSS/Atom for their reading.